Mainstream medicine vs. PDT (PhotoDynamic Treatment) for Cancer. All doctors we met were against us going for any form of cancer treatment unless it's surgery (of tumor), followed by intense chemo an radiation therapy! They all said "30% chances of success! Immediate action. Cut off affected areas!" We approached NGPDT as our choice of cancer treatment. Now we have only started the first course of the treatment (8 days) - and already we are in dilemma if we have made the right decision! IF YOU or anyone you know is going through cancer, please read this website - there are alternatives to cancer treatment to consider. But you need to have the faith and believe and guts to take on this lonely path towards a non-invasive treatment approach. 13 Aug, 2011 (day 13): 5 days after the last NGPDT treatment (8Aug), we approached an Oncologist in Singapore. When he heard of our NGPDT treatment, he indicated (facial expression) disapproval. We requested for an Ultrasound scan and blood test to ascertain the progress of the tumor. 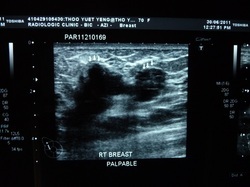 15 Aug, 2011 (day 15) : Oncologist told is that the Ultrasound report showed that the 2 tumors had grown in size and fused into one big one. He was very concerned and recommended an immediate surgery to remove the tumors and the lymph nodes (to be done within same week). 16 Aug, 2011: I called Scott Waters, Dr Alexander and Dr. Ye Yulin. They said that tumors are expected to swell for 3 weeks after NGPDT treatment. It is likely that the 2 tumors which we very close to each other had fused due to the swelling. Assured us NOT to be alarmed. Blood test showed normal body response - did not indicate extreme immune system reaction. Recommended us towait 3 weeks - the tumor will show signs of reduction in size. What do we do? Oncologist looks at SIZE of tumor as indication of severity of tumor. NGPDT specialists looks at tumor reaction (swelling) as indication of positive response to treatment. OPPOSITE opinions - we are in dilemma on next course of action. 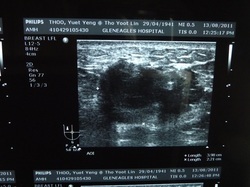 Breast Chart from Ultrasound - 13 AUG - AFTER NGPDT. Tumors fused. Swollen. Small cyst (8 o'clock position) disappeared.